Show me an example Maine Moose Tracks - Greenville Maine Moose Watching Tours: Last Night of Spring Brings Out Moose! Today is the official start of summer! 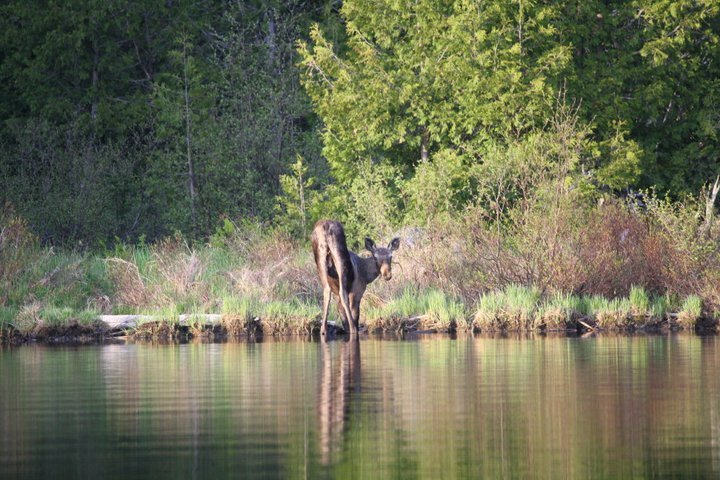 Last night on the final night of spring, we had a group of six take a nightly canoe moose safari. The weather was a sunny with just a little wind here and there. The group got to see a bull and cow moose on the pond. They also got to see some other great Maine wildlife such as deer and loons, they group even got the special opportunity to see a loon's nest! With the start of summer, there should be an abundance of moose roaming around in Maine. Don't miss your chance to see these great animals, book a trip with us today!